New Year’s Eve was a disaster. After work, at about 7:30, I went to pick up the food that Joy ordered at 3:00. In the standing-room-only area around the take out area, I waited for my name to be called, and waited. At 8:30, I asked to speak to the manager who said our order was almost ready. To make a long story short, I finally got the food at 10:00, fully 7 hours after the order was put in!! The manager was ‘terribly sorry’. At home, the food was ice cold. My sister-in-law woke up at 4:00AM, sick as a dog. 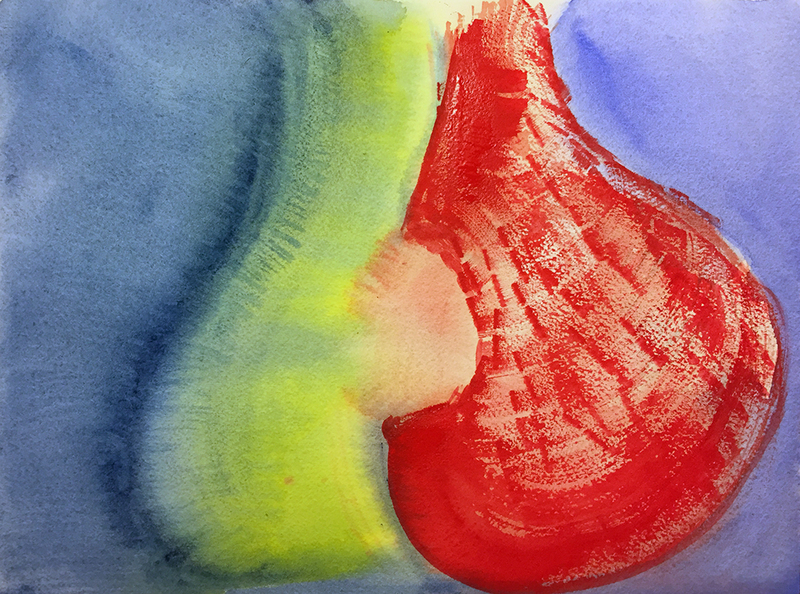 I experimented with two types of blues, the greenish Prussian blue and cobalt blue, a reddish blue. I merged the Prussian blue with a some of a yellow pigment field, on the left side of the composition. Adjacent to the yellow, I painted a red figure. At first, it reminded me of a bottle or other vessel. To the right of the figure, I painted in the cobalt blue. An errant drip of clear water in the center of the paper created a ‘hole’ in my red bottle. In the context of the inauspicious beginning of the new year, I now see my ‘bottle’ as a wrecking ball. I hope this is not a predictor of the tenor of the coming year. This entry was posted in Personal Stories and tagged abstract art, abstract expressionism, art, artistic process, creative process, creativity, New Year's Eve, painting, visual arts, watercolor. Bookmark the permalink. Thank you for that, Charlotte. Best to you in the new year! Thank you, Kerf. I’ll drink to that! Best to you as well! Better luck my a__. Forgive me but I would have sued, or would be suing, or would at least be talking to an attorney. And why did you wait? I would have seen a bowl of cereal in my future at 8 o’clock. But this is the important question: What restaurant was this? You can review restaurants on several sites on the Internet. I would certainly take the time to warn off as many new customers as possible. They (the restaurant and the customers) deserve to hear this story. Thanks, Patsye. First I want to get a refund. My sister-in-law was glad handed by the GM, so I’m getting the name of the regional manager. After that comes the review wars. And you’re right, I should have left way earlier with a refund. Work is in progress. It’s got to get happier, the new year, that is. p.s. I forgot to mention that I’m almost finished reading “The Tale of the Dueling Neurosurgeons” by Sam Kean. I love his books and you’d enjoy his non-fiction anecdotes. Thanks for the reference, Patsye. I’ll check it out!